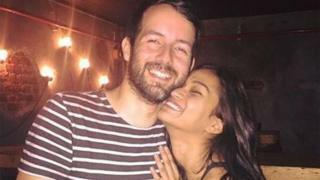 A pregnant Indian woman has been refused entry to live in Scotland with her Fife husband because her language qualification for entry to the UK is too advanced. Alexandria Rintoul, 22, wants to join her husband, Bobby, in St Andrews but was "shocked" when her visa was denied. Mrs Rintoul passed an advanced English exam but the visa requires a different and much easier one to qualify. The Home Office said Mrs Rintoul could apply again for the £2,000 visa. Mr Rintoul, 33, told the BBC Scotland news website: "We were told the visa process is difficult so we should hire an immigration lawyer to help us, which we did. "They told Alexandria to do the higher test and we submitted all the evidence requested of us. "However, we have now received a rejection letter on the basis she has over qualified herself with a more technical test than required. "It says she should do a lower one so she can be entitled to be here and that she did the higher one unnecessarily. "They say we can apply again but it costs £2,000 for each application. "Its just a money making outfit as they could have used some discretion and accepted the higher qualification." Mrs Rintoul, a musician who also has an English degree, sat an International English Language Testing System exam. The Home Office requires an IELTS pass for immigration - but not the more advanced one Mrs Rintoul has. A Home Office spokeswoman said: "Some applicants for visas to settle in the UK need to pass an English language test at an approved centre that is specified in the immigration rules." "Mrs Rintoul failed to do this and also failed to submit the necessary supporting evidence for her application. It is open to her to reapply under the Priority Visa Service." While they deal with her second application, Mrs Rintoul has been staying in hotels in Bangalore, which is a four-hour journey from her home in Shillong, a hill station in the north-east state of Meghalaya. The couple met when Mr Rintoul, who works in the oil and gas industry, spent a year and a half in India. They moved to Dubai before Mr Rintoul returned home, hoping to be followed shortly by Mrs Rintoul.